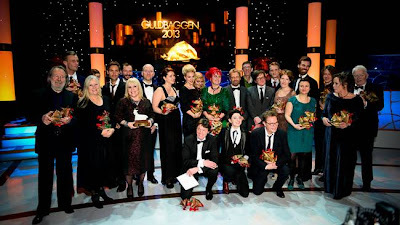 The Swedish Film Institute held the gala ceremony tonight for the 48th Annual Guldbaggen filmpris ("Golden Beetle" film awards) at Cirkus in Stockholm with Babben Larsson as host. Gabriela Pichler's Äta sova dö (Eat Sleep Die) came into the evening with just five nominations but won four of them including Best Film. It also won for Best Director, Best Actress (Nermina Lukač) and Best Screenplay. The film is about a Balkan immigrant who faces difficult choices when her factory announces layoffs. Mikael Marcimain's Call Girl had led with 11 nominations. The controversial film also won four prizes, but all in the craft categories – Best Cinematography, Costume Design, Sound and Production Design. Axel Petersén's Avalon and Palme by Kristina Lindström and Maud Nycander each picked up a pair of trophies. The Best Foreign Language Film winner was Amour by Michael Haneke, winning against Wes Anderson's Moonrise Kingdom and Canadian film Laurence Anyways by Xavier Dolan.